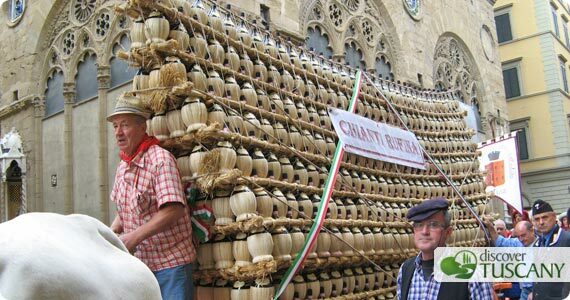 If you’re in Florence this weekend, plan on hanging around the area between Piazza della Signoria and Piazza del Duomo between 4 and 5 p.m. to get a glimpse of the “carro matto“, which literally means crazy cart. The cart is pulled by a pair of white Chianina oxen and carries over 1500 wine bottles, the traditional flask ones with straw bottoms, that are artfully assembled and presented to the ruling government in Palazzo Vecchio. The cart is preceded by a parade in historical costume, the beat of drums and the show of Florence’s flag throwers which perform in Piazza della Signoria at the very end. You can read our post on the Carro Matto from last year as well as see our gallery of photographs of the parade and flag throwers in Piazza della Signoria. The setting is incredible and it is fun to see all the Renaissance costumes :). Parade starts around 3.30 pm near the Palagio di Parte Guelfa and heads first to the Duomo where the wine is blessed by religious authorities. The cart then proceeds down Via Calzaiuoli and stops at Chiesa di San Carlo dei Lombardi where an offering of wine is made, then arrives in Piazza della Signoria around 5 pm. The flag throwing exhibition is set to start around 5.30 pm. Hope you enjoy the show!